Launched on February 11, 2010, the spacecraft for the Solar Dynamics Observatory (SDO) mission started to capture ultra-high quality Sun imaging data for NASA. The SDO is a part of the Living With a Star (LWS) program that is managed by the Heliophysics Division of NASA’s Science Mission Directorate. LWS’s goal is to scientifically understand all the naturally connected Sun-Earth systems that directly affect and influence life on Earth. 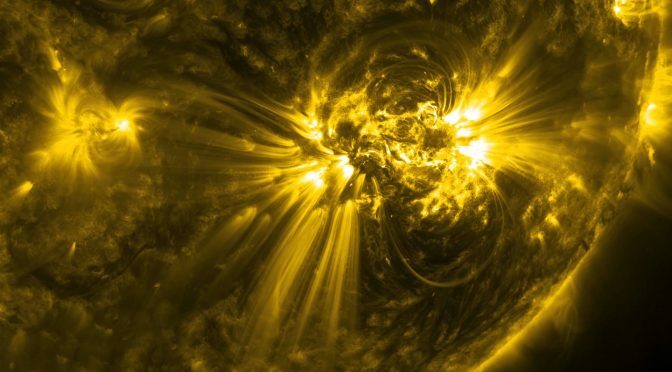 SDO’s spacecraft images the Sun every twelve seconds in ten different wavelengths of invisible (to the human eye) ultraviolet light from an orbiting distance of about 36,000 km (22,369 miles) and a speed of 3.075 km/s (1.9 miles/s). Distance from Earth: 149.6 million km (92.9 million miles). Light needs 8 minutes and 19 seconds to get from the Sun to the Earth, traveling at a speed of 299,792,458 m/s (meters per second). Surface area size: 12,000 times the size of Earth’s. It would take you about 190 earth-days to fly (once) around the sun, by flying at a full speed of an average commercial plane (about 965 km/h or 600 miles/h). On Earth you would need about 42 hours. Mass: 333,000 times the mass of Earth. Diameter: 1,391,000 km (864,400 miles). It’s about 109 times the diameter of Earth. Volume: 1.41×10^18 km (about 1,300,000 Earths). Surface gravity: 28 times the surface gravity of Earth. Meaning that, if your weigh is 70 kg (154 lb) on Earth, it will be 1960 kg (4321 lb) on the Sun. Some people think that the Sun is a star on constant fire, but that’s not the case. There can’t be any fire for there’s no oxygen. The light and energy that’s being produced and emitted by the Sun is being made by nuclear fusion reactions where Hydrogen fuses into Helium. About 620 million metric tons of Hydrogen are being fused (each second) in its core. Extra info: what is the biggest star in our galaxy? 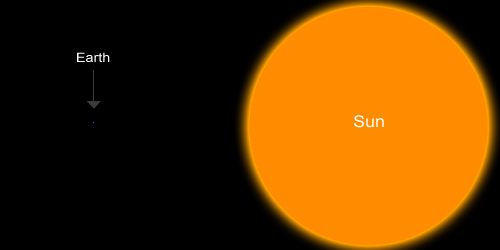 The size of our Sun is minuscule when compared with UY Scuti. It’s (about) like comparing the surface area of a grain of sand with the surface area of a bus. Ok, maybe not a bus, but a huge yoga ball for sure! It would take you about 1071 years to fly (once) around UY Scuti in a usual commercial plane while flying at full speed (about 965 km/h or 600 miles/h), in comparison with the Sun where you would need only… about 190 days.